Erna A. Dahm, 86, Formerly of South Spring Street and Parknoll Lane, Port Washington died Friday, March 5, 2004 at Marian Heights in Port Washington. 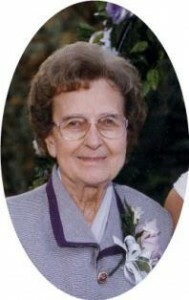 She was born January 6, 1918 in Lake Church, Town Of Belgium, Wisconsin to Charles and Hattie Wille Heller. On April 4, 1942 she married LeRoy J. Dahm of Port Washington at Friedens Church in Port Washington. Together the couple resided on South Spring Street In Port Washington and raised their family. Erna was a homemaker and took in Alan, Bill Dan and Stephen Groth after their parents died. She also worked as a clerk for the former Port Cleaners and Biever’s Ben Franklin Store. LeRoy preceded her in death January 31, 1982. In the mid 1980’s Erna moved to Parknoll Lane. She loved her family and was proud of her grandchildren taking an active role in their lives. She was also active with Friedens Church with the Evening and Afternoon Ladies Guilds. Erna loved to travel and took numerous group bus trips around the state and country. She is survived by her children Kathleen (Mack) Grempel of Parker, Colorado, Patti (Chet) Schroeder of Campbellsport, WIsconsin, Denise Plutowski and LeRoy (Roseann) Dahm both of Port Washington. Erna’s grandchildren are Melissa, Andrew, Matthew, Emily, Michelle, Leah, Nicholas and Dawn and her great grandchildren are Michael and Kayla. She is further survived by Alan, Bill and Dan Groth, nieces, nephews, other relatives and friends. Her husband, Stephen Groth, a brother, Gilbert Heller and three sisters Etta Zeckmeister, Ella Behring and Marie Lund preceded her in death. Funeral Services 6 PM Tuesday, March 9, 2004 at Friedens Evancelical Church, 454 N Milwaukee Street, Port Washington, with Pastor Mark Voll officiating. Interment St. Mary’s Cemetery, Port Washington. Visitation after 4 PM Tuesday AT CHURCH. Memorials to the Badger Association of the Blind and Visually Impaired appreciated.